Two builders were suspended from work on a £400,000 council development after a man accused them of wolf-whistling at his wife. The angry husband, who has asked not to be named, sent an email to North Herts District Council complaining that his wife was sexually harassed. He alleged that two young builders working on a council redevelopment in the centre of Royston, Herts., wolf-whistled as she walked by. The men, both in their mid-20s, were immediately suspended by council contractors Maylim Ltd while the allegation was investigated. However, the man who complained has now refused to take the matter further,meaning the two builders will return to work. Thomas O’Mahony, Managing director of Maylim Ltd, today described wolf-whistling as ”unacceptable” behaviour. He said: ”We were alerted by the council who had received an email of complaint. ”Our site manager managed to speak to the person who told him that it was the two young guys on site but refused to say anything more about the incident. ”We acted within half an hour of being alerted to the complaint. It’s company policy to immediately suspend anyone who is made the subject of a complaint by the public. ”We don’t tolerate wolf whistling or any form of sexual harrassment. It’s unacceptable, we are in the public eye and our image is important. ”The two men are in their mid 20s and they have been invited in tomorrow for a discussion. They denied the allegations and were frustrated to be off work. Maylim Ltd is carrying out £400,000 enhancement works to transform Fish Hill Square in Royston, Herts., into a renewed civic space. The project has been funded by the central Government Growth Area Fund and work began on July 4 and is scheduled to last 12 weeks. 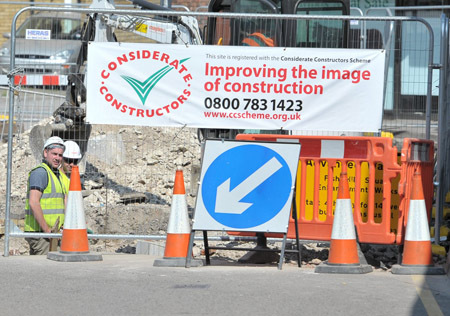 North Herts District Council received an email alleging that builders working on the site had sexually harassed a passerby on July 20 this year. In the email a man claimed that his wife had been left too scared to walk near the square after she was wolf-whistled at by builders. David Scholes, strategic director for planning at North Herts District Council, referred the matter to council contractor Maylim Ltd, which employed the builders. He said: ”The council was contacted and concern raised about the conduct of builders working on the Fish Hill Square enhancement.